While a lot of people seem to be obsessed with homemade scrubs (made out of sugar, olive oil, and the like), I prefer to spend the money and get them from stores. Perhaps I'm doing something wrong, but the few scrubs I tried to make myself were a fuss to prepare, and unpleasant to use. They left my skin oily for long hours, made a slippery mess on the shower floor, and went bad very quickly. Although I enjoy using natural products for other purposes, I don't plan on venturing into scrub-making again, especially now that I have found one that I really (really!) 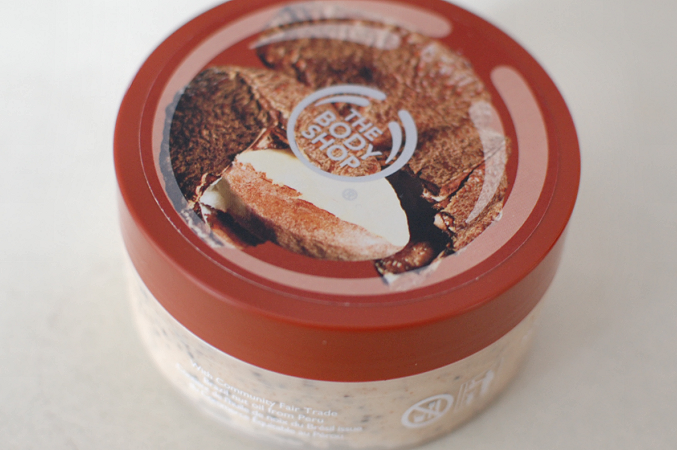 enjoy: the Brazil Nut Body Scrub from The Body Shop. It costs C$20 for 200ml here in Canada, but I never buy The Body Shop products at full price, as they often have amazing sales where you can get their products for 50% off (plus the 10% discount offered with the Love Your Body rewards card). First of all, the scent is heavenly. The company describes it as "sweet and nutty", and it is, but those two alone words do not do it justice. You really need to smell it for yourself to understand; and, if you did, tell me if you love it as much as I do. It is sweet and warm, without going overboard like other sugary and artificial smells of baked goods. It is pleasant and comforting, especially well-suited for the colder months. The texture is lovely as well. 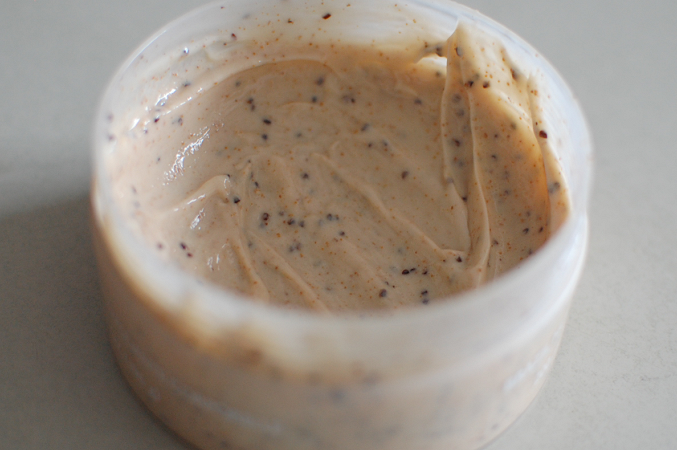 The scrub manages to exfoliate and feel hydrating at the same time, as the creamy product is mixed in with "evening primrose seeds" and "crushed walnut shells". The latter are quite large and rough (in a good way), while the seeds are hardly felt at all: the overall experience is not irritating and the slightest, and leaves my skin soft and smelling great, all of this without any oily residue. Would I repurchase? For me, it's a definite "yes". This sounds like a very "yummy"scented product. I love nutty scents for the fall/winter. Will have to check that out for sure. Thanks for recommending. Sure :)! If you do end up buying it, let me know what you think! i absolutely adore the brazil nut scent. for serious. i bought three of the brazil nut body butters all in one go b/c of it. Haha, I totally understand. I might have to go after the body butter next! real good pictures! may we reach you ?